Asbestos is probably one of the most studied substances ever. Asbestos is synonymous with argument and controversy: it is magic but feared, essential but dreaded, a strategic natural raw material but a source of concern and hazard; it is banned but still used safely, and so the list goes on. Asbestos-related diseases are certainly of significant concern in terms of occupational and public health. Asbestos World Health Organisation officials estimate that 125,000,000 people worldwide are exposed annually to asbestos in occupational settings, and > 100,000 people die annually of diseases associated with asbestos exposure. Use of asbestos has been banned in most developed countries, but chrysotile asbestos is still used in many developing countries. This book presents the state of the art in the vast multidisciplinary research field of asbestos and of mineral fibres in general. The protagonists of the book are the mineral fibres with their immense complexity and poorly understood biochemical interactions. The approach of the chemist/mineralogist/crystallographer puts the fibre in focus whereas the approach of the biochemist/toxicologist/doctor assumes the perspective of the organism interacting with the fibre. The perspectives of both the 'invader' and the 'invaded' must be considered together to establish a conclusive model to explain the toxicity of mineral fibres. In fact, this sharing of different perspectives and working in a multidisciplinary way is the key to understanding the mechanism of asbestos-induced carcinogenesis. With this in mind, the state of the art in the field of mineral fibres is illustrated and discussed here, with a multidisciplinary approach taking into account all the different scientific strands (biology, chemistry, epidemiology, mineralogy, physics, toxicology etc.). The different views have been considered in an attempt to assemble the pieces of the jigsaw and to present the reader with an up-to-date and complete picture. Some of the results presented here arise from a long-term Italian Research Project of National Interest (PRlN), in operation since 2011. The project is aimed at the characterization of mineral fibres and at understanding the nature of their biological interaction mechanisms, with special attention to chrysotile, amphibole asbestos and fibrous erionite. A general model to classify mineral fibres on the basis of their toxicity would be of paramount importance to predict a priori their potential toxicity, to identify their occurrences, and eventually to plan a risk-assessment analysis for the population. Because we live in a fibre-rich world, it is very likely that mineral fibres other than asbestos, erionite and fluoro-edenite will soon be recognized as potential carcinogens, and mineral fibres of little or no commercial/economic value may become sources of concern in the future. Having a predictive universal model would be a powerful tool in risk assessment and prevention, especially for reducing exposures to naturally occurring asbestos (NOA), now a source of considerable concern worldwide. The first part of the volume deals with the characterization of mineral fibres: the crystal structure of mineral fibres is described in Chapter 2. Chapter 3 describes the crystal habit of mineral fibres and the problems related to the definition of 'mineral fibre'. Chapter 4 reports the bulk spectroscopy of mineral fibres and Chapter 5 explores the application of vibrational spectroscopies (FTIR, Raman) to the analysis of asbestos minerals. 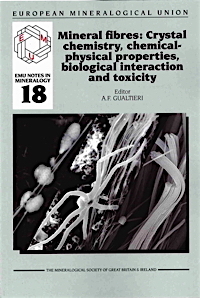 Chapter 6 explores the surface and bulk properties of mineral fibres relevant to toxicity. Chapter 7 enters the world of the thermal stability of mineral fibres. The middle part of the volume deals with the in vitro (Chapter 8) and in vivo biological activity of mineral fibres (Chapter 9); Chapter 10 describes their dissolution and biodurability. The core of the volume dealing with epidemiological, biochemical and medical studies on mineral fibres includes Chapters 11, 12, 13 and 14, with focus on the differential pathological response and pleural transport of mineral fibres, their biological activities, and lung epithelial cell toxicity and pulmonary fibrosis. Chapter 11 is about the epidemiological approaches to the health effects of mineral fibres and the development of knowledge and current practice, Chapter 12 deals with the 'Differential pathological response and pleural transport of mineral fibres'. 'Biological activities of asbestos and other mineral fibres' is the subject in Chapter 13 while Chapter 14 gives an insight into mineral fibre-induced lung epithelial cell toxicity and pulmonary fibrosis. More general issues concerning the global asbestos problem and perspectives to establish a general model to predict mineral-fibre toxicity are described in the final Chapter, no. 15. (2017) xvii + 536 pp. ISBN 978-0903056-65-6.